Vanilla Textured, Glendale is a sophisticated classic design ideal for any home. For individually shaped rooms the classic simplicity of Glendale creates a perfectly fitted environment with its own personality. 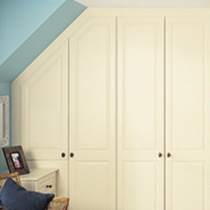 Shown in the image is our angled doors which are made to fit your angle perfectly. 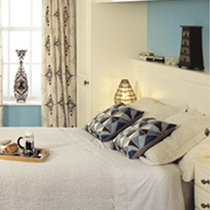 As a made to measure bedroom the design can be made in around 50 different vinyl colours.